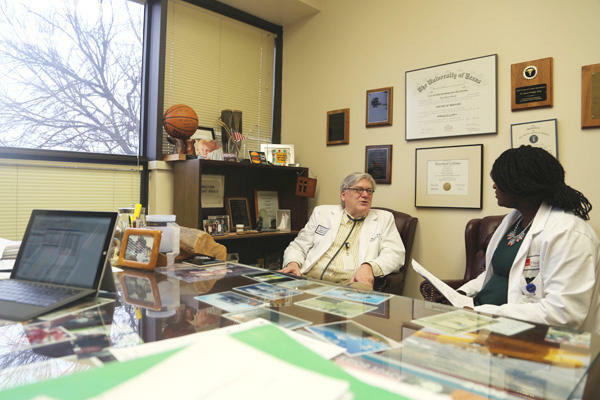 Dr. David Wright, an HIV physician in Austin, speaks with University of Texas Medical Branch student Lola Longe in his office at University Medical Center Brackenridge in Austin. The number of young physicians applying to infectious disease fellowships has been steadily declining over the last five years. Experts in Texas and across the country are worried about this looming shortage of HIV providers and brainstorming ways to turn this trend around. Dr. David Wright is one of these experts. He's a family medicine doctor in Austin who was one of the first physicians to treat people with AIDS in Central Texas in the 1980s. When he sees his HIV-positive patients, he doesn’t rush through the appointment. On a recent morning at the University Medical Center Brackenridge in Austin, he asked a patient a number of questions – about how he's feeling and whether he's having challenges in taking his medication, Kaletra – followed by a physical exam. HIV doctors spend a lot of time with each patient, going through issues with medicines, for example. "The medicines have side effects, the medicines are expensive. The patients are constantly in a state of flux where they have insurance or they don’t have insurance," Wright says. Many HIV patients are on Medicaid or Medicare, and the reimbursement rate is lower for HIV doctors than for specialists who perform procedures, like colonoscopies. "So when you start to factor that out, a lot of young intelligent physicians look at, 'Well, gee, this is how much time it’s going to cost me, and the reimbursement rate is so poor, I’m not even going to go there,'" Wright says. But in the meantime, Wright, who’s 64, says most of the providers are in his age group and in some years will begin to retire. "It’s going to be a big conundrum in about another five to seven years," says Wright, who's not the only one worrying. "We already know that there are areas where there are not adequate individuals trained in HIV care," says Dr. Wendy Armstrong, who leads the infectious diseases fellowship program at Emory University in Atlanta and is a professor there. She’s passionate about recruitment because of what she sees regularly. "As someone who practices in the South and actually leads a very large HIV clinic, the epidemic is very strong and growing in certain areas in America," Armstrong says. To reverse that trend, some organizations are adding mentorship programs for trainees, fellowships for minorities in HIV medicine and scholarships to fund student projects. Jonathan Colasanti is among the shrinking pool of doctors who didn’t need much convincing to pursue HIV medicine. He’s an infectious diseases fellow at Emory whose passion for it dates back a long time. "Back to the time I was probably 14," Colasanti says. "I got involved with HIV care in my community in Charlotte, N.C., and just fell in love with persons living with the disease, and saw the disease at a much different time than we are now in terms of treatments available and how patients survive." Unlike Colasanti, Lola Longe, a third year medical student at the University of Texas Medical Branch in Galveston, says she hasn’t given much thought to HIV medicine. For one, she’s concerned about a work-life balance. "That’s a priority, and as I talk to my fellow med students I feel like we’re choosing lifestyle over the intensity of the job because a lot of us are getting burnt out," Longe says. Longe says prioritizing income is only fair. "I don’t think it’s because people who work in the medical field are bad people," Longe says. "They just want to be reimbursed for the amount of work they put in. 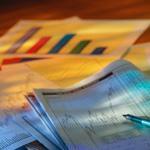 A lot of people are overworked and a lot of us have a lot of debt." After medical school and residency, physicians have a debt that can average $200,000. The Infectious Diseases Society of America has a study underway, interviewing residents to understand what leads them to choose or not choose infectious disease medicine, and that may help with future recruitment strategies. Part of President Barack Obama’s signature health care law is a provision that protects people with pre-existing conditions from being denied insurance coverage, including people who are HIV positive. Still, the Affordable Care Act hasn’t solved everything for HIV patients. More people are living with the Human Immunodeficiency Virus in Travis County. Between 2006 and 2012, the number of people with HIV has increased 41 percent -- to 5,084 people. During those years, the overall population of Travis County increased only by about 17 percent. Dr. Phillip Huang, Medical Director of Austin/Travis County Health and Human Services, says much of the increase is because of life-sustaining HIV drugs. A new interactive map illustrates cases of HIV and possible treatment and testing centers. The map was compiled by the non-profit AIDSVu, using city, county and federal data. National HIV Testing Day was this week, providing a chance to increase awareness about testing and treatment efforts among at-risk populations and inspire who may be living with the disease to seek help in managing it.